Joseph Phelps Insignia is one of the truly great iconic Napa wines, capable of appealing to almost all wine lovers, embodying a Bordeaux style with Napa flair. Critics have been effusive about the 2014 vintage, declaring it as excellent. As such, following our release last week of Dominus 2014, we are delighted to be able to offer Insignia 2014. In 2014, Insignia has been awarded 96 points from Robert Parker who states ‘It is another beauty, with the oak well-disguised by the extravagant fruit extract. Drink it over the next 30+ years.’ James Suckling thinks it has surpassed even 2013, awarding it 97 points, describing it as ‘Great Wine’. Antonio Galloni was also dually impressed awarding it 94-97 points, saying ‘it is shaping up to another magnificent wine from Joseph Phelps.’ High praise from the leading critics for a stunning wine which we can offer at £930 per case of six bottles, excellent value for a leading Napa wine. Insignia is released on allocation and historically secondary market trading begins after two years when the vintage premium effect begins to pay dividends. That said the 2012 has increased 50% in two years since its release. With 96 points the 2014 surpassed the 2010 which trades at £1,200. The vintage premium is evident, making Insignia a prime candidate for investment. It is worth noting that Insignia made 14,500 cases, which enables them to maintain a superb price on release, far lower than most other similar scoring leading Cult Napa wines. 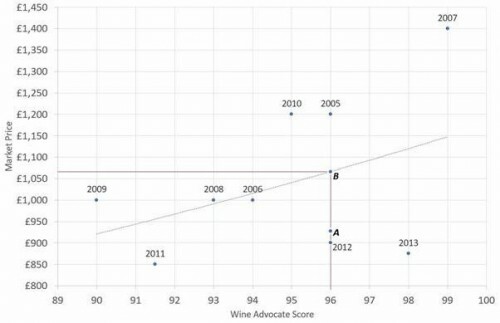 The 2014 release of Insignia presents an opportunity – a graphical analysis of the current market price of past vintages, compared with their respective Wine Advocate scores, identifies today’s release price of £930 per 6 bottles as being considerably undervalued for its 96 point score (point A). Past vintages would indicate an average case price of £1,065 for a 96 point Insignia (point B). This points toward an upward shift on the graph, from point A to B, equating to a potential appreciation of £135 once the market has corrected to its natural price. This only furthers the incentive of buying the 2014 vintage on release. Since 1974, Insignia has been produced in every vintage; in the early years Phelps purchased fruit from other independent growers but since 2004 100% of the fruit has come from his own Estate. Joe’s son, Bill, now runs the winery, with Ashley Hepworth – a talented young winemaker who earned her stripes at Ch. Angelus in St. Emilion before working at Joseph Phelps – continuing the legacy of producing world-class wines and earning praise from both Robert Parker, James Suckling and Antonio Galloni. The blackberry, dark-chocolate and walnut aromas are persuasive. Full body, a dense and fruity center palate and beautiful depth and intensity. The tannin texture is exceptional. Great wine. Drink in 2020 and onwards. The 2014 Insignia is shaping up to be one of the surprises of the vintage. A rich, explosive Insignia, the 2014 exudes pedigree. A host of dark red cherry, plum and pomegranate notes make a strong first impression. Bright, vibrant aromatics add lift, while beams of salinity contribute to the wine’s energetic personality. One of the interesting aspects of the 2014 is that there is no Merlot in the blend.